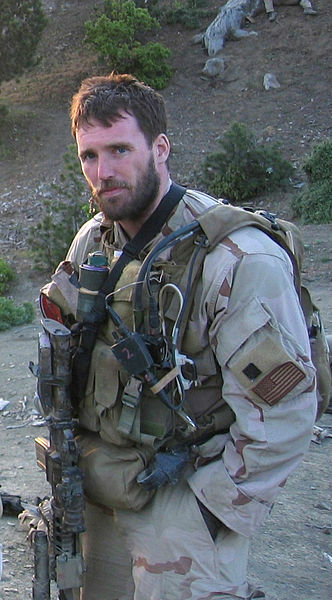 In memory of Navy Lieutenant Michael Murphy, 29, of Patchogue, N.Y., who was killed in Afghanistan June 28th, 2005. This workout was one of Mike's favorites and he'd named it "Body Armor". From here on it will be referred to as "Murph" in honor of the focused warrior and great American who wanted nothing more in life than to serve this great country and the beautiful people who make it what it is. Partition the pull-ups, push-ups, and squats as needed. Start and finish with a mile run. If you've got a twenty pound vest or body armor, wear it. If you want to read the first-hand account of Murph's heroism and that of his team, look up "Lone Survivor" by Marcus Luttrell. - With a partner, one partner working at a time to complete the whole workout together. - Reduce the reps/run distance. - If pullups are your limiting factor, do ring rows instead. You can partition the rep scheme as you want. 20 rounds of 5 pullups, 10 pushups, and 15 squats works very well. 47:35 RX w/ body armor. Narrowly escaped Pukie... 50:13 No Body Armor, thank you.